Hey guys, RL is happening over here in a big way. My new full time job is going to take a bigger slice of my time than I had anticipated. What this means for you is …. it’s SALE TIME at FLUKE! I’m cutting all prices way down! The in-world shop will close it’s doors sometime next month, so be sure to put on your shopping hat soon! Come check out the new couples pose at Fluke. Best advised to do this in the water. It’s hawt! And don’t miss the 50% off sale on selected pose sets and shapes! Pose Fair 2013! It’s returning next year! 2012 was our first chance to participate in this fun event, and sadly it was Katey’s last, as she announced that after 3 years she was ready to move on to other things. Today we learn that she is passing the torch to RubyStarlight Writer, who will organize a brand new Pose Fair with a few minor changes. What these changes are is unknown at this time, but as successful as Pose Fair has been in the past, let’s hope it continues to get better! 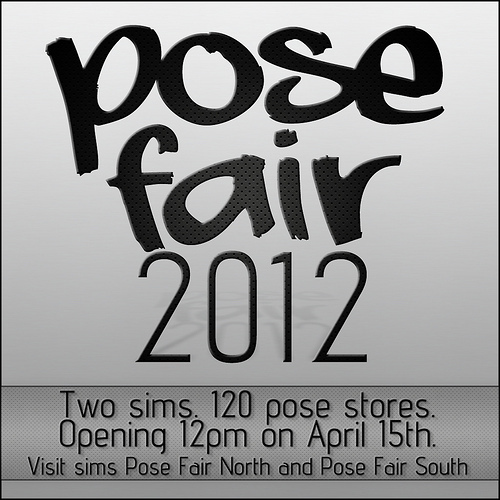 Pose Fair 2012 officially begins today! \o/ Come and visit Fluke, as well as 2 sims full of awesomeness from great creative people. The Fair opens today at noon. Don’t miss it! Our team of moderately skilled and highly paid lawyers have advised us that to avoid a potential lawsuit we will need to change our brand name. “Free*Style(tm)” is a brand owned by Creamy Cooljoke and has been in existence since 2007. While researching the brand name “Freestyle(tm)” within Second Life(tm), our crack team of researchers turned up no similar brands. I asked our lawyers if we could then sue Linden Labs(tm) dba “Second Life(tm)” for a faulty search tool, but they advised against that as none of them actually has a license to practice law. We simply hired them because they could quote every episode of Ally McBeal. Bygones. At any rate, the store formerly known as “Freestyle Shapes & Poses” will now be known as “Fluke”. Please join the new group. The old one will be disbanded later today, and I hate the rude message people get when being ejected from a group. I also fear the potential lawsuits from former members who were hurt by the mean text.